On looking over the history of the rise of the wed even from the writings of the earlier and more or less partisan historians, a reader will not fail to be impressed with the wonderful resourcefulness that was displayed in meeting the unexpected exigencies of war. Viewed from an absolutely impartial standpoint, the South apparently accomplished the impossible. The young Confederacy succeeded against heavy odds in making something out of almost nothing. There was no naval warfare in the proper sense of the word during the four years' conflict; there were no fleets that met in battle at sea, and only two or three actions that could be touched upon in strictly naval annals. But at the outset, in the making up of the Government of the new republic, there was formed a Navy Department whose accomplishments, struggling against the difficulties that confronted it, were little short of marvelous, considering the limited time, available for preparation, in a country almost barren of ship-yards and other means of providing and equipping sea-going vessels, not to mention warships. In the closing days of 1860, the secession of South Carolina made the fact apparent to the people of the North and South that the breach was constantly widening between the two sections of the country. Very soon it was perceived that the ever-growing chasm could not be bridged by diplomatic means, and that to sustain the stand they had taken the seceding States would be forced by the urging voices of their leaders to make an appeal to arms. The South was immeasurably handicapped in more ways than one, but principally by its utter lack of any war-ships, and its dearth of even the nucleus of any naval force. The secession of Mississippi, Florida, Alabama, Georgia, and Louisiana in quick succession made for a sure commencement of hostilities. In February, 1861, delegates from the seceding States met at Montgomery, Alabama, and organized a new Provisional Government; the breach had widened beyond all hope of repair; the only manner in which the matter could be settled was by war. Jefferson Davis was made the President of the new republic, and the task he had to face might well have appalled a less resourceful brain. Without a treasury, without an army, and without a single gunboat, the new President appointed his cabinet, and assigned the post of Secretary of the Navy to Stephen R. Mallory, of Florida, who had served his State in the United States Senate, and for years had been chairman of the Naval Committee of the House of Representatives, an experience that stood him in good stead. The problems that confronted the other ministers were perplexing, but that which faced the new Secretary of the Navy was the most monumental of them all. The South did not own a vessel capable of being fitted out as a ship of war. There were only two navy-yards in the South--one at Norfolk, Virginia, which State had not then cast her lot with the secessionists; the other navy-yard was at Pensacola, Florida, and was not fitted for construction work but intended only for repair and shelter. Even though it had been perfectly adapted to the construction of ships of war, the Federal Government held the fortifications that guarded the entrance to the harbor, and blockading squadrons could have stopped or destroyed any vessel that attempted to pass out to sea. There were a few small private shipyards scattered throughout the South, but not one with the plant necessary to build and equip a warship of even moderate tonnage. In addition to this, there was but one manufacturer in the South who could construct an engine of sufficient power properly to propel a serviceable gunboat; there was a scarcity of iron, and there were no factories equipped to roll the two-and-one-half-inch plate that served to armor the ironclads soon to replace the wooden ships. There was but one plant in the South that could supply large-caliber guns, and that was the Tredegar Iron Works in Richmond, Virginia, which was out of the jurisdiction of the Confederate States until after the firing on Fort Sumter.. There was wood enough in the South to have built a mighty fleet of ships, but it was standing in the forests, uncut and unseasoned, and in everything necessary for the equipment and construction of serviceable war-ships, the South was lacking or very poorly supplied. There was no money in the Confederate coffers to buy all these necessities, and while the existence of the Confederacy as a revolutionary body was recognized by the world-powers, its stability as a Government was not acknowledged, and its credit was not established. An additional obstacle in the path of the formation of a Confederate navy was the fact that the great powers of Europe issued proclamations of neutrality almost immediately after the first gun had been fired at Fort Sumter, and the lesser powers soon followed the lead of the greater ones. In substance, these proclamations allowed ships of either navy harbor for the purpose of making repairs or of securing supplies. No ship might reenforce her crew in any of these foreign ports or make any alterations other than repairs necessary to make their crafts seaworthy; they were to receive on board no ordnance Supplies or any other "contraband" articles; they might not take on board more than enough coal to carry them to the nearest port in their own country, and they could. not coal in the harbor of any one power more than once in three months, except by special permission. This was the situation that faced the Secretary of the Navy of the Confederacy after the opening of hostilities. But even before the war-cloud had broken over the Nation, Secretary Mallory had started to build up his organization, undismayed by t to contend against. There were many Southerners in the Federal navy whose sympathies were with the new Government, and their resignations were daily being handed to the authorities at Washington, and their services tendered to the Confederate States. Many of the men who left the Federal service were commanders of ships, and there were instances where they might easily have turned their vessels over to the Confederacy, but, without an exception, they returned the ships entrusted to them to the Federal Government before leaving the service, thus "retiring with clean hands." There were also several officers on coast-line vessels that were in Southern ports after the firing of the first gun, who sailed back to the North with their ships before going south to join the Confederates. Four admirals, 10 captains, 81 commanders, 100 first lieutenants, second lieutenants, 20 masters, in line of promotion; 12 paymasters, 40 assistant. paymasters, 22 surgeons, 15 passed assistant surgeons, 30 assistant surgeons, 1 engineer-in-chief, and 12 engineers. That all the admirals, 4 of the captains, 5 of the commanders, of the first lieutenants and 5 of the second lieutenants shall be appointed solely for gallant or meritorious conduct during the war. The appointments shall be made from the grade immediately below the one to be filled and without reference to the rank of the officer in such grade, and the service for which the appointment shall be conferred shall be specified in the commission. Provided, that all officers below the grade of second lieutenant may be promoted more than one grade for the same service . . .
One of the first Southern naval men to resign from the Federal Naval Department was Commander Raphael Semmes, who at once went South to enter the service of the new Government. He was sent to the North to secure what arms and ammunition he could, to contract for the delivery of more, and, if possible, to find ships that might serve as a nucleus for the navy of the Confederacy. 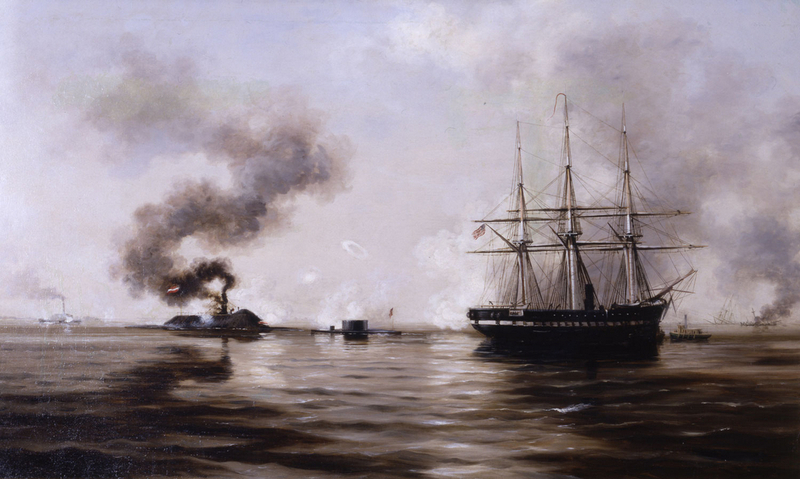 A large amount of ordnance supplies was delivered or contracted for, but no vessels could be found that would be in the least adapted to service on the high seas, and with this portion of his mission unfulfilled, Semmes returned to Montgomery, twelve days before the firing on Fort Sumter. Meanwhile, other agents of the Government had been attempting to find suitable ships in the Southern harbors that might be bought. All of these were reported as unsuitable for service as naval vessels, but Commander learning the qualifications of one of them, asked the Secretary of the Navy to secure her, have her altered, give him command, and then allow him to go to sea. The secretary acceded to this request, and the little boat was taken into New Orleans and operations were started to transform her into a gunboat which might fly the Confederate colors and, by harassing the commerce of the North, do her share in the work of warfare. The plans for the reconstruction of the vessel had scarcely been completed when the word was flashed around the world that Fort Sumter had been fired on and had fallen, and the ship, the first of a navy that was to contend against the third largest navy in the world, was christened after the first fort to fall into the hands of the Confederacy, the Sumter. The Navy Department of the South now redoubled its efforts to provide the ships necessary for the defense of its coast and inland rivers. Almost any craft that could be fitted to mount a gun was pressed into service, and as quickly as the means would allow, these boats were prepared for their work, and officers and crews assigned to them. As soon as war had been declared it became evident that Virginia would join the seceding States, and before the hasty and ill-advised evacuation of the great navy-yard at Norfolk, the Federals destroyed as much of the property as they could. Six of the seven ships that were then in the Gosport yard, on the 20th of April, when the destruction was commenced, were totally destroyed, but the seventh, the screw frigate Merrimac, after being burned almost to the water-line, was saved after the Federals had left, and the Confederate authorities, under the direction of John M. Brooke, late lieutenant, United States navy, immediately started the reconstruction of the wreck on plans that were new to naval warfare. On the 8th of March, in the following year, the armored Merrimac, rechristened the Virginia, raised the hopes of the Confederacy, and closed the day of the wooden battle-ship by the sinking of the Cumberland and the destruction of the Congress in Hampton Roads, Virginia. The hopes she had roused, however, were shattered on the day following by the advent of Ericsson's Monitor. A number of other Federal ships were seized after the opening of hostilities, among which were the revenue cutters Aiken, Cass, Washington, Pickens, Dodge, McClelland, and Bradford. All of these boats were fitted out for privateering as quickly as possible, and went to sea with varying fortunes. The Aiken was rechristened the Petrel, and her career was soon ended by the United States frigate St. Lawrence, from which she was attempting to escape. The treasury of the Confederacy was soon supplied with enough currency to start operations, and with the share allotted to it the Navy Department commenced to make its small fleet as formidable as possible. All the shipyards that had been taken possession of or could be secured from private parties were equipped to handle the work of construction and refitting. Every ship that could be found that might answer any of the purposes of the navy was purchased, and before the close of the first year of the war thirty-five steamers and sailing craft of various dimensions, classes, and armaments had been any others were in the process of construction. Of those in commission, twenty-one were steam vessels, most of them small, and chosen for speed rather than power. The armament of all was very light in comparison with the war-ships of the Federal fleets. Several of them carried but one gun, others carried two, and the majority carried less than five. Quite wonderful was the advance made in other departments than that of shipbuilding. The Navy Department had erected a powder-mill, engine-, boiler-, and machine-shops, and five ordnance workshops. There had been established a rope-walk capable of making all kinds of cordage from a rope-yarn to a 9-inch cable and able to turn out eight thousand yards per month. This was in addition to the eighteen shipbuilding yards already planned and in operation. The ladies of Georgia had presented to the Confederate States a floating battery that was partially finished at the end of the first year of the war. The State of Alabama had turned over an iron-clad ram as a gift to the Confederate service. Most of the ships that had been completed at the close of the first year of the war were sent to sea as privateers to hamper the Northern merchant marine. Others were used to guard the mouths of the rivers of the Confederacy, while several of them moved on the offensive in the rivers. The George Page (renamed the Richmond), a small steamer, lightly equipped, soon became well known to the Federals for its continual menacing of the forts on the Occoquan River and Quantico Creek, often advancing close and firing shells into them. Soon after the commencement of the war, the Confederate privateers became such a menace that President Lincoln issued a proclamation that all the privateers would be regarded as pirates, and that their crews and officers would be subjected to punishment as such. Six months after the issuing of this order the crew of the captured privateer Savannah was tried for piracy, but the jury disagreed. While awaiting a new trial, the Confederacy imprisoned an equal number of officers of the Federal army, who were held as prisoners of war, and notified Federals that whatever punishment was inflicted upon the privateersmen would be imposed upon the officers who were held as hostages. The great nations of the world refused to accept the ultimatum of the Union that the privateers were practicing piracy, and from that time to the close of the war the men captured on privateers were treated as prisoners of war. Now took place, on the part of the Confederate Navy Department, a most important move which opened a new chapter in naval history. On the 9th of May, 1861, Secretary Mallory, convinced that the resources of the Confederacy were not sufficient to complete a navy that would be adequate to maintain the defenses of the waterways of the South, commissioned James D. Bulloch to go to England and attempt to have some suitable ships constructed there, informing him at the same time that the necessary funds would be secured and placed at his disposal by the representatives of the Confederacy in England. The matter of building war-vessels in England presented many difficulties, for, under the British policy of' neutrality, any ship of either of the warring powers that took on any armament or other equipment that was classed as contraband, was guilty of a breach of the neutrality agreement, and might be taken possession of by the British Government. Captain Bulloch, a graduate of Annapolis, was well suited to the task, and he at once entered into negotiations for the building of two ships, which were to be delivered to him personally as his property. While built on the general lines of ships that would be suitable for privateering, they were not to be armed or in any way equipped as battle-ships by their makers. In spite, however, of all the precautions taken, the ships were not more than half completed before the suspicions gents were aroused. But, though they were morally certain that the ships were to serve in the Confederate navy, there was no tangible evidence upon which they could be detained, and both boats were completed and sailed out of English waters without any contraband stores aboard them. They were later equipped at other ports from ships that had carried out their arms and ammunition. Bulloch remained in Europe during the greater part of the war, and was a valuable assistant to the Secretary of the Navy of the Confederacy. During the time in which he was superintending the gathering of this foreign-built force, Secretary Mallory was also organizing his department for efficient work in providing for the needs of all naval forces. He organized a bureau of orders and details, a bureau of ordnance and hydrography, a bureau of provisions and clothing, which also had charge of the paying of the naval forces, and a bureau of medicine and surgery. These bureaus were headed by competent men, and the detailed work of the department was soon being carried on in a thorough, business-like manner. The matter of securing recruits was easily handled; there was no time when the number of men enlisted was not more than was necessary to man all the ships in the service. The men enlisted in the navy who could not be sent to sea were usually assigned to garrison the forts on the coast and along the rivers, while at times they were called upon to serve in the field with the regular army. Most of the ships that were built for the Confederacy abroad were manned largely by recruits gathered on foreign shores, some of them being natives of the Confederate States, and others men who sympathized with the cause sufficiently to fight under its colors. The danger in running these boats through the blockading squadrons that lined the Confederate shores and the impossibility of getting men out of the ports on other ships, made it necessary to take what men could be secured. These vessels are always officered by Confederates bearing Government commissions. The pay of the officers of the Confederate navy was based on a sliding scale, regulated by the length of service and the occupation of the officer, as was the law in the Federal service. The pay, however, was larger. An admiral received $6000 a year; a captain's pay, when commanding a squadron, $5000; on any other duty at sea, $4200; on other duty, $3600, and on leave or awaiting orders, $3000. The pay of other officers was to be regulated by length of service, but as the first increase in pay was to come after five years' service, none of the officers benefitted by it. The pay of a commander on duty at sea was $2825 a year for the first five years after the date of commission, and on other duty, $2662. Commanders on leave or awaiting orders received $2250. Lieutenants commanding at sea received $2550; first lieutenants on duty at sea received $1500 a year, and the same when on other duty. When on leave or awaiting orders they received $1200 a year. Second lieutenants when on duty at sea received $1200 a year, and when on leave or on other duty received $1000. Surgeons on duty at sea received $2200 and when on other duty $2000 a year. At Richmond, very early in the struggle, a naval school was established by Secretary Mallory and placed under the command of Lieutenant William H. Parker, a former officer of the United States navy, who, at the outbreak of the war, had already seen twenty years of service. In July, 1863, the steamship Patrick Henry, then at Richmond, was converted into a school-ship. She was ordered to remain at anchor off Drewry's Bluff in the James River to lend assistance, if necessary, to the defense of the capital. In the fall of the year the Confederate States Naval Academy was formally opened with an efficient corps of professors. Throughout the exciting times of 1864-65 the exercises of the school were regularly continued, and many of the students gave a good account of themselves before the war was over. Recommended Reading: The Confederate Navy in Europe. Description: The Confederate Navy in Europe is an account of the Confederate officers and officials who went on missions to Britain and France to buy ships for the CS Navy, and to support CSN operations on the high seas, such as commerce raiding. Spencer tells the story of how some officers rose to the occasion (some did not) and did a lot with limited resources. The majority of the ships ordered never reached America. Shipbuilding takes time, and as the war dragged on the European powers were persuaded by Confederate battlefield misfortunes and US diplomatic pressure that it was most expedient to deny the sales of such innovative designs as ocean-going ironclads. Like other out-manned and out-gunned powers, the CSA did have to resort to ingenuity and innovation. Recommended Reading: Confederate Submarines and Torpedo Vessels 1861-65 (New Vanguard). Description: The primary Union strategy during the American Civil War was a massive naval blockade of the entire Southern coastline of the Confederacy, and it was in the effort to counter this blockade that the Confederates developed their first submarines and torpedo boats. This book traces the development of these new technologies, including the CSS ‘Little David’ and ‘Hunley’ - respectively the first torpedo boat and submarine to sink an enemy warship. The wreck of the ‘Hunley’ was raised in 2000, and this is the first book ever to integrate details of its recovery with an account of Confederate submarines in action.